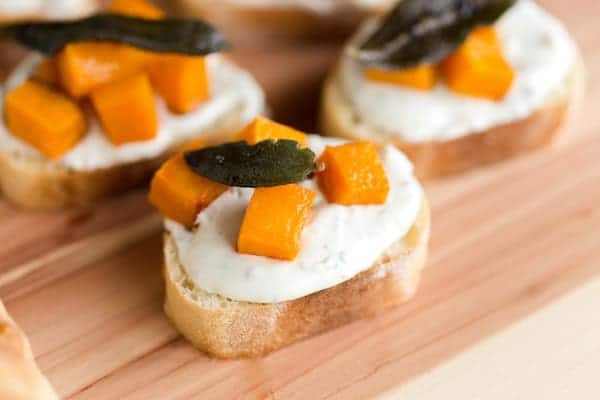 Butternut Squash Whipped Sage Cream Cheese Crostini is a super simple holiday appetizer that can be prepped in advance! If you like sage, you are going to LOVE this simple whipped sage cream cheese spread. 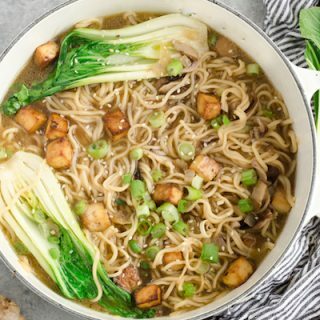 This post is sponsored by GO VEGGIE. 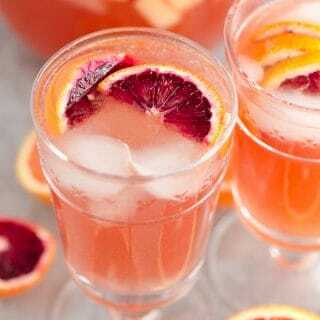 The recipe and opinions are all original and my own. Thank you for allowing me to share the brands that I love with you! 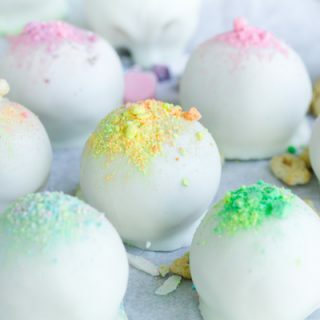 Okay, so I know I said those Bourbon Pecan Pie Truffles were my last Thanksgiving recipe, but I just couldn’t help but squeeze this last one in! 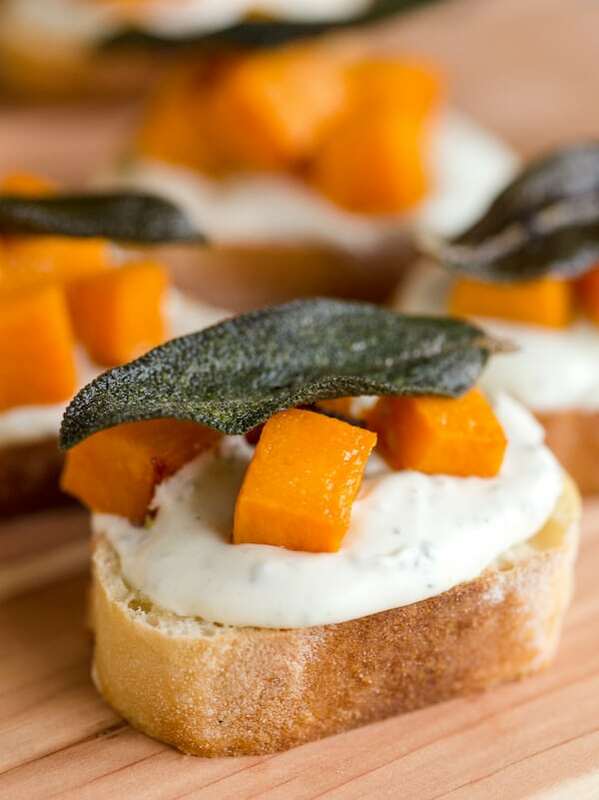 We all need these Butternut Squash Whipped Sage Cream Cheese Crostini on our Thanksgiving table, don’t you think?! You see, a few weeks ago on Instagram I asked what kind of Thanksgiving recipes people wanted to see. I had a lot of requests for brussels sprouts (see: Butternut Squash and Brussels Sprout Gratin), desserts (see: Chocolate Pecan Cheesecake Bars and those truffles I just mentioned), salads (how about that Apple and Blue Cheese Shredded Brussels Sprout Salad? ), and appetizers. Hmm…I almost fell short delivering what the Instagram people wanted! But fear not. 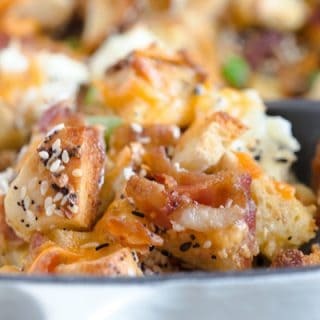 I pulled my act together yesterday, and created a super delicious and (even better) super easy appetizer for the big day. 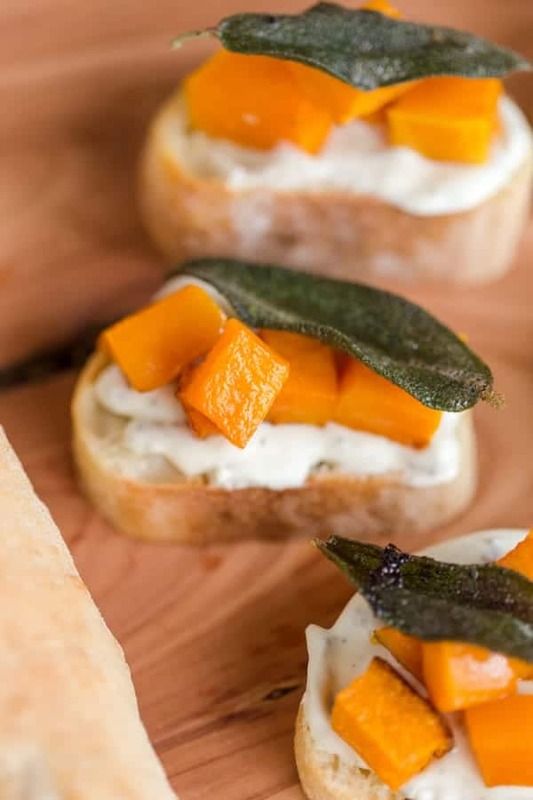 These Butternut Squash Whipped Sage Cream Cheese Crostini are the *perfect* way to get the meal started! 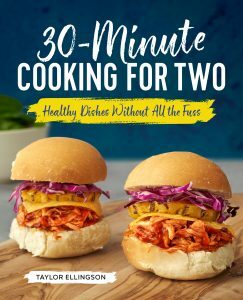 Best yet – they can be prepped in advance! There are basically three steps to making these crostini. Step one is roasting the butternut squash. 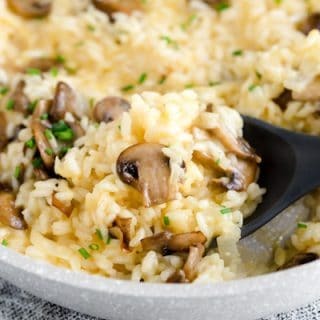 Toss in olive oil. Roast in the oven. Easy peasy. Step two is making the whipped sage cream cheese. Put the cream cheese, sage, and milk in the food processor. Done. Step three is toasting the crostini. Self explainable. That’s it! Okay, that’s a lie. You can fry up some fresh sage if you wanna be extra like that. Butternut Squash Crostini are Vegan! Okay, so let’s talk about the cream cheese in these appetizers. 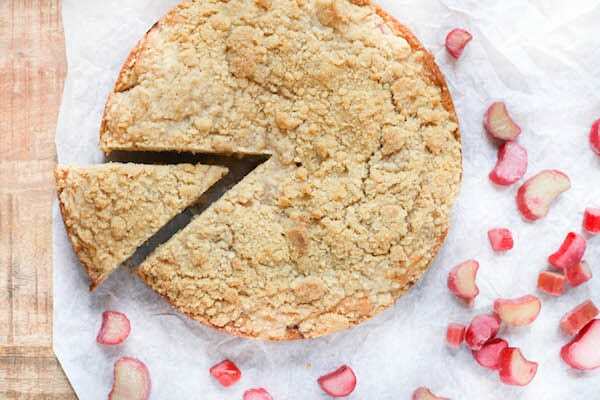 I used GO VEGGIE plain cream cheese which just so happens to be dairy-free, lactose-free and vegan. 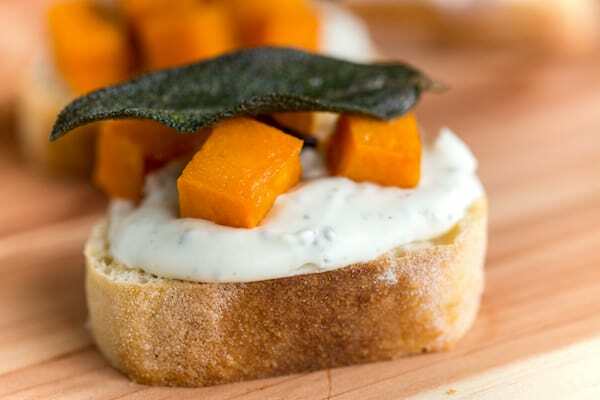 That means these Butternut Squash Whipped Cream Cheese Crostini can be enjoyed by everyone! Well, unless your cousin is on that keto diet. Tell her to stick to the meatballs. 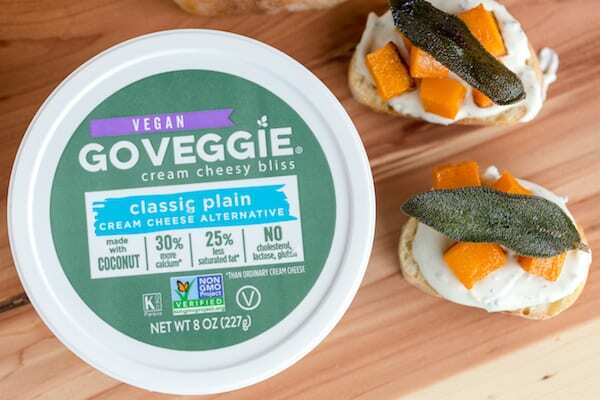 While you can certainly use regular cream cheese and regular milk in the recipe, using GO VEGGIE Plain Cream Cheese will lower the saturated fat and calories in the overall appetizer. Bonus: it tastes the same. 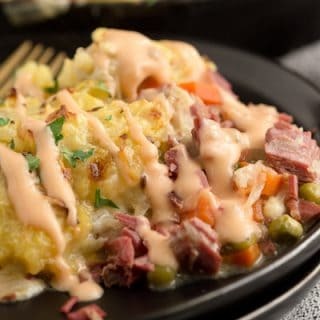 So while I really hope you haven’t waited until now to figure out your whole menu or what you’re bringing to your family’s Thanksgiving, I also really hope you have. Because these crostini are a must make!! 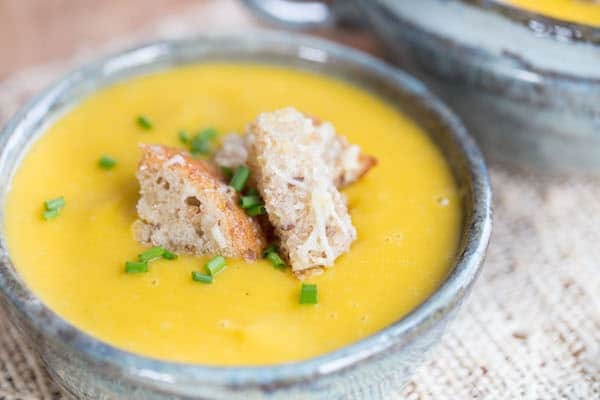 Place butternut squash on a baking sheet and drizzle with olive oil. Season with salt and pepper and toss well. 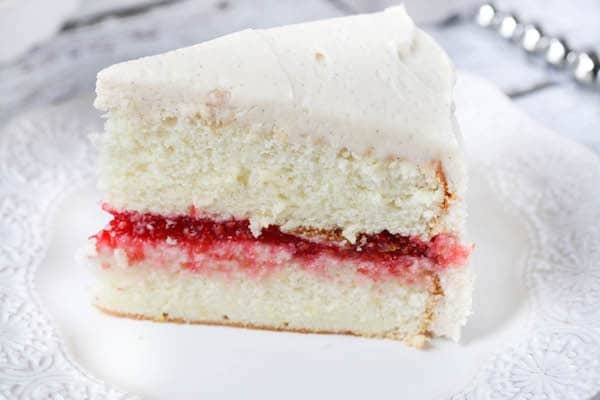 Place GO VEGGIE Plain Cream Cheese in small food processor. 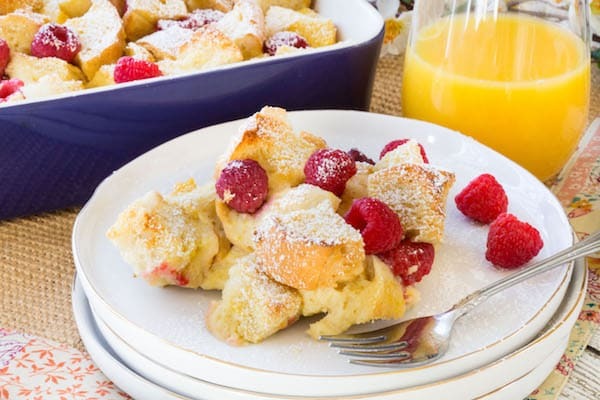 Add sage, 1 tablespoon of milk, and salt, and puree until well combined. Add additional milk if it needs to be thinned out a little. Brush each slice of crostini with a little bit of olive oil. Bake in 400 degree oven for 5-7 minutes. Heat olive oil in a small to medium skillet over high heat. Once it is hot, add sage leaves and fry for 30 seconds. 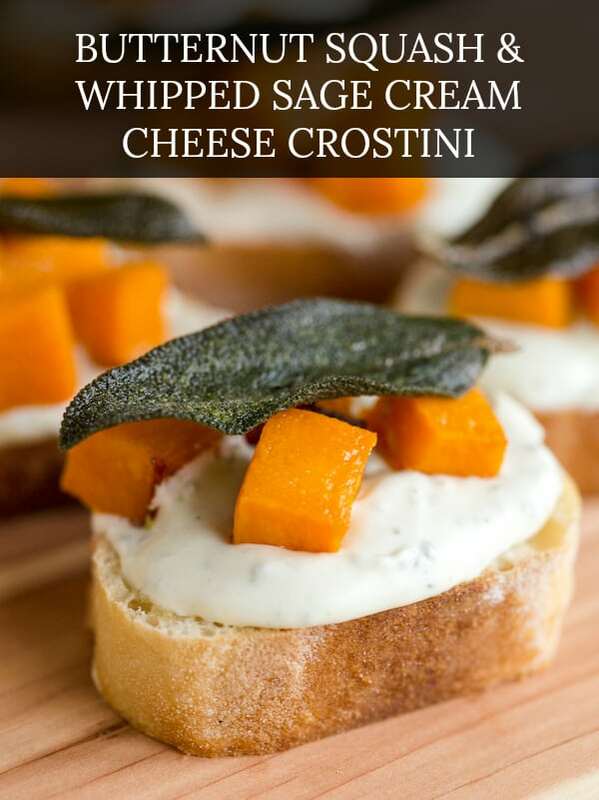 Spread each piece of crostini with cream cheese. Top with butternut squash and a sage leaf.